Being at home definitely has its perks. There’s the free food, the parents to make fun of…aaaaand the awesome kitchen gadgets! 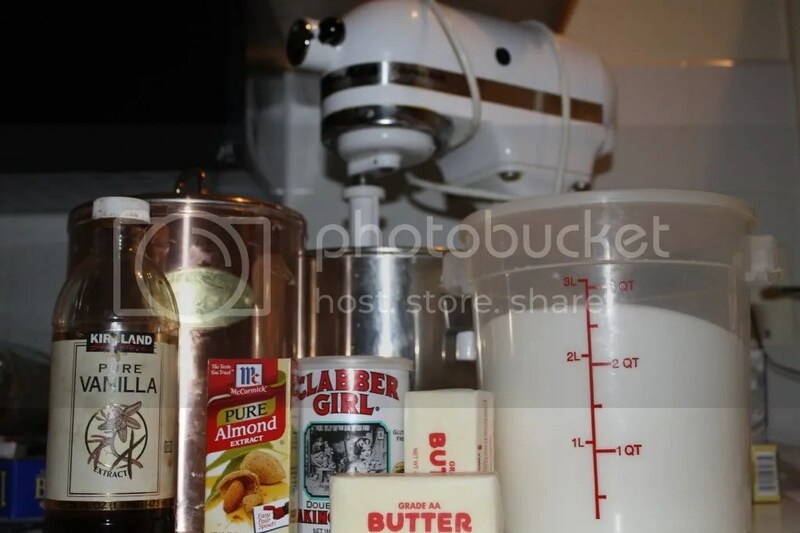 We’ve got a standing mixer (be still my heart), a huge cuisinart (it works like a DREAM), a cookie press (adorable and retro), a Canon SLR (note the new and improved photos!!!!!!!!! !1), and a bajillion other amazing tools and appliances that get my heart fluttering. It is SWEET. Also my parents are weirdly popular so I’ve gotten to tag along to a benefit and an elementary school to read with kids already. AND we attended a boxing match last night! Ring side seats! It was actually pretty great. It was the culmination of an online documentary series about two guys that quit their desk jobs to become boxers. Pretty fantastic. But yeah, people know my parents and its weird. Hopefully I’ll be that cool someday? Well….yeah no that won’t happen. Whatever. At least I can cook? Cause I can. And I can bake! And bake I diiiiiid!! These spritz cookies are a holiday classic. 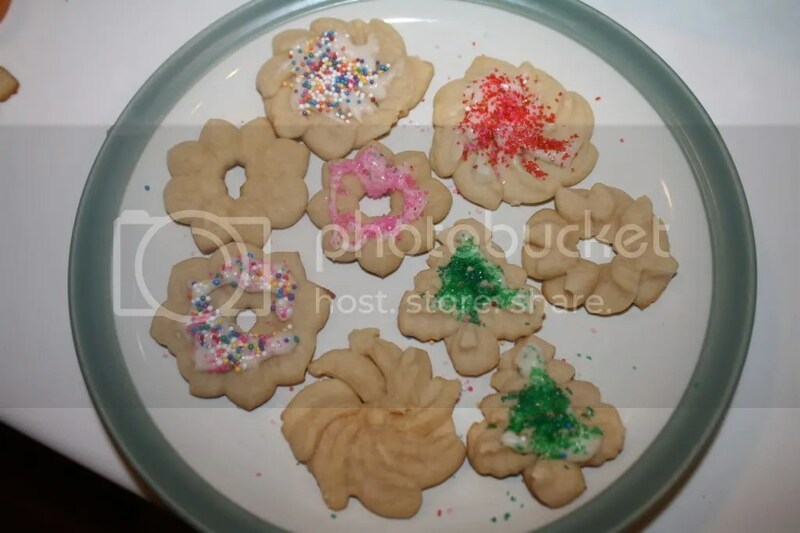 My beloved Aunt Zin made these cookies every year for Christmas along with a few other favorites. Now that she’s gone, the cookie recipes have been divided amongst us and I came up with the spritz and a few others. I decided to try these first…twas a good choice. So these cookies are pretty great yeah? 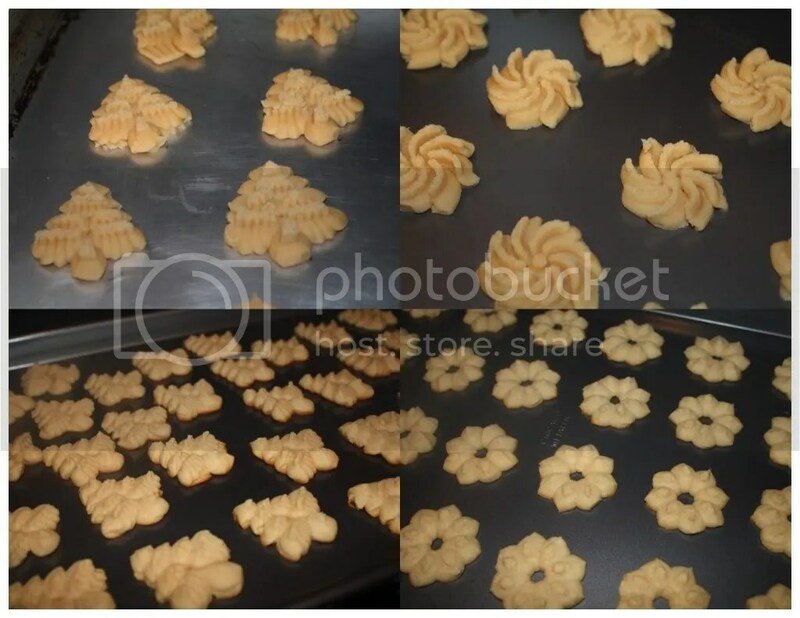 They take no time to make and if you have a cookie press you can make them into fun little shapes!! The dough is pretty basic, featuring the usual suspects: butter, sugar, flour, eggs, vanilla, milk, and baking powder. 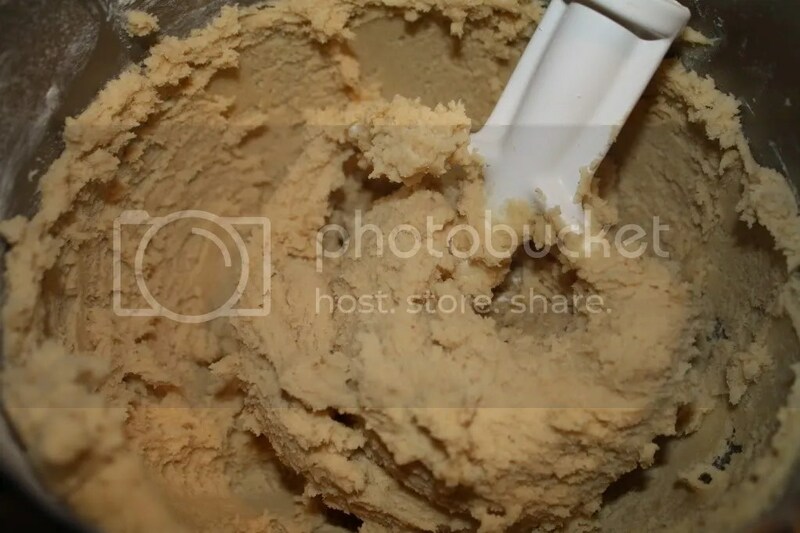 However, it gets an extra kick from the addition of some almond extract, which not only smells awesome but also lends quite a nice flavor to the cookies. Butter, egg, vanilla, and almond extract...yes. After mixing the batter comes the fun part! 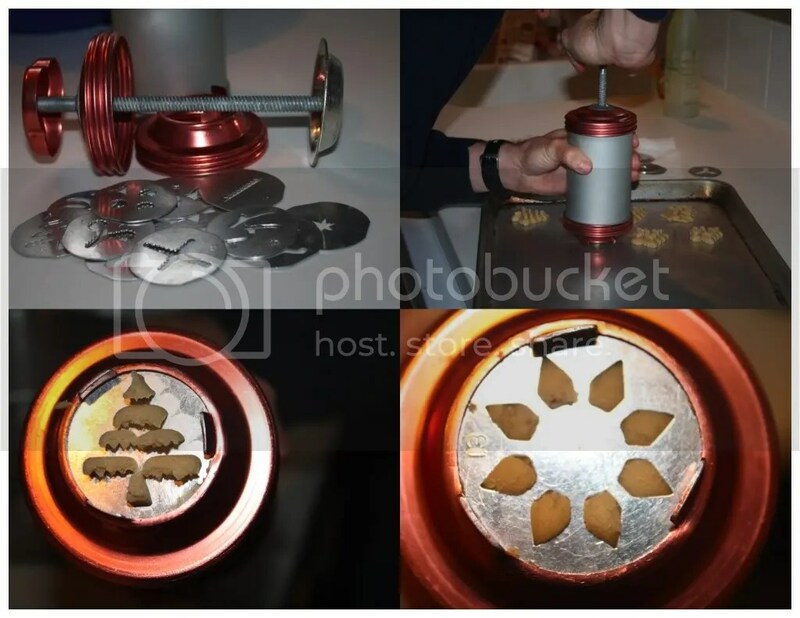 My dad scored my grandma’s cookie press, which basically is a metal cylinder that is filled with dough and has a screw on nozzle that is fitted with different disks for different cookie shapes (you can change the shape!!) that you twist to push the dough out. So greeeat! ...and squeezed out into adorable shapes!! Yeah, there was a camel. And yeah, it was awesome. So there are a lot of shapes, like tiny stars, a dog, a butterfly, a weird line (? ), and some other squiggly funky junk. I opted for the festive christmas tree, the wreath flower thing (close enough), and a ballin exploding star spiral. Also the camel, cause it is beyond cool that there was a camel shape. It’s important not to chill the dough cause it needs to come out of the press easily and stick to the cookie sheet. 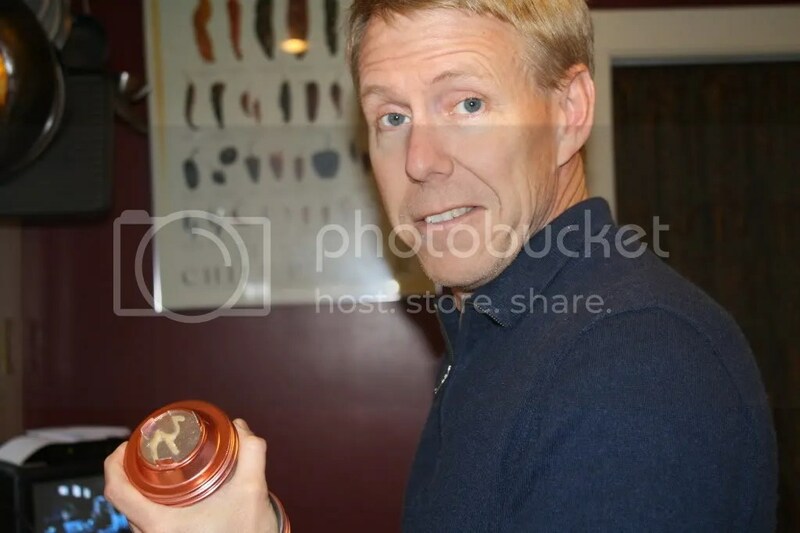 Now, I understand that many of you may not be blessed with a cookie press. No worries! I’m not judging. 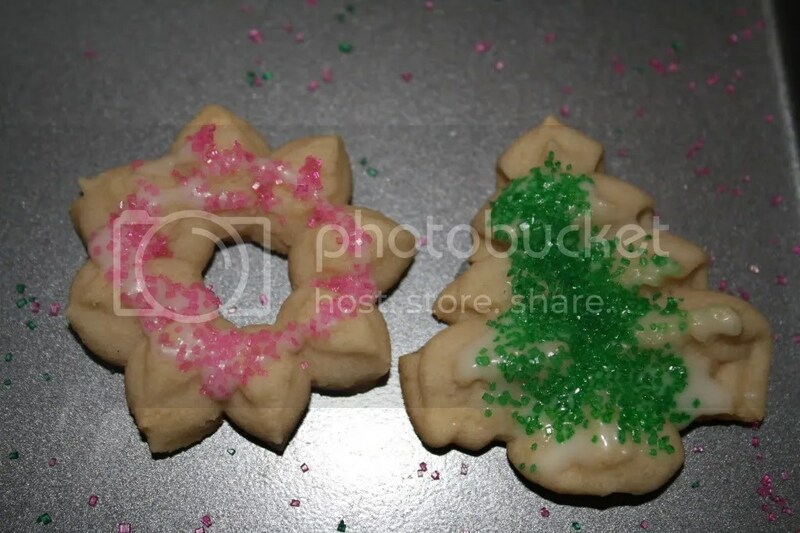 You could also roll the dough out and use cookie cutters OR roll it into a log, chill it for an hour or so, and slice it into rounds to bake and decorate. So many possibilities! Traditionally my aunt served these guys iced with sprinkles so, of course I decided to follow suit. I whipped up a simple icing consisting of butter, powdered sugar, vanilla, and milk. Frosting in general is super easy to make and so was this one. Melt your butter in a small dish, microwaving it for about 20 seconds should be enough. Add your milk and vanilla to the melted butter and stir so all your liquids are combined. Put the powdered sugar in a medium sized bowl and slowly whisk in your liquids. Add the butter, milk, and vanilla slowly so you can stir it in and come out with a nice smooth icing as opposed to clumpy and gross. Voila. Icing. After my cookies had cooled I got to icing a few. This icing is just thin enough to get drizzled onto the cookies without running errywhere. Once I had drizzled my icing, I just sprinkled on some sprinkles. Once I get into mass producing these guys for xmas I will probably fill some shallow bowls with the sprinkles so I can dunk them in and get a more even coating. Still, they’re pretty darn adorable and a family classic! Soooo much icing! Such cute sprinkles!! Preheat oven to 350ºF. In a large bowl cream butter and sugar till light and fluffy. Mix in egg, milk, vanilla, and almond extract until well combined. 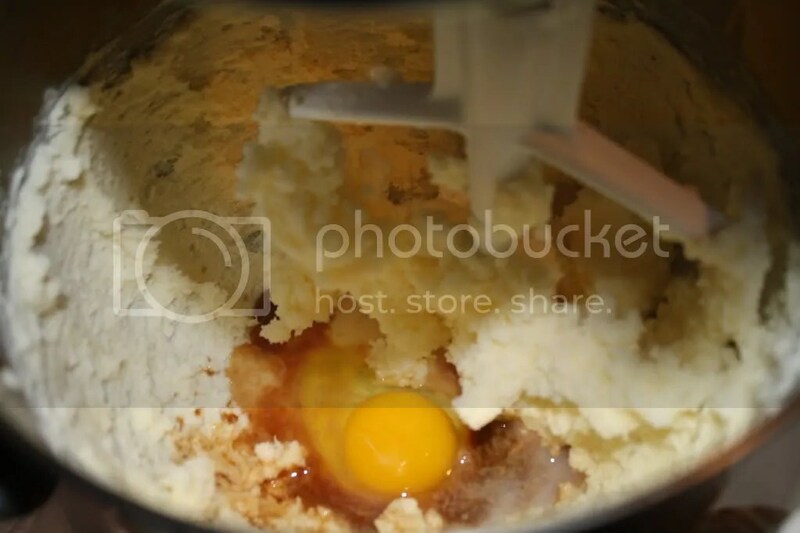 Gradually add in flour and baking soda, mixing well to make sure all dry ingredients are properly incorporated. 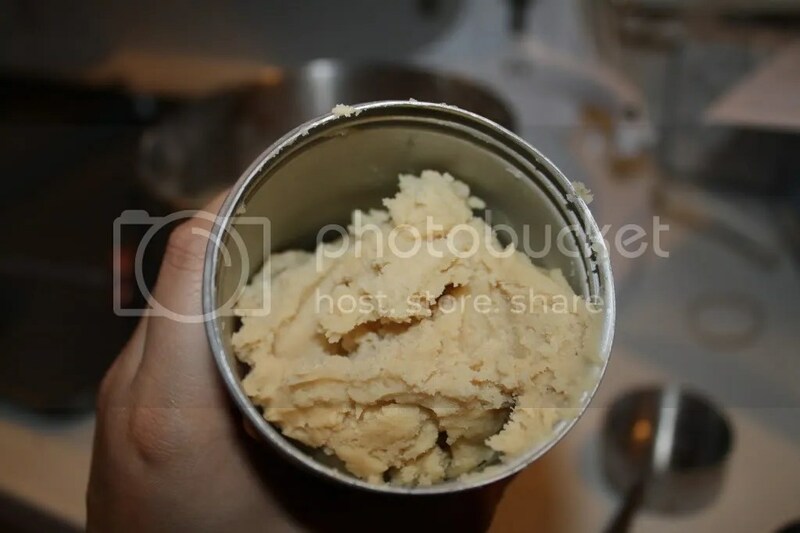 Do not chill* Fill cookie press with dough and with desired disk. Press dough onto cookie sheet. Bake for about 10-12 minutes, till bottoms are golden brown. Cool for a few minutes on sheet then move to rack to finish cooling. Drizzle with icing and cover with sprinkles. In a small microwavable bowl, melt butter. Combine melted butter, vanilla, and milk. 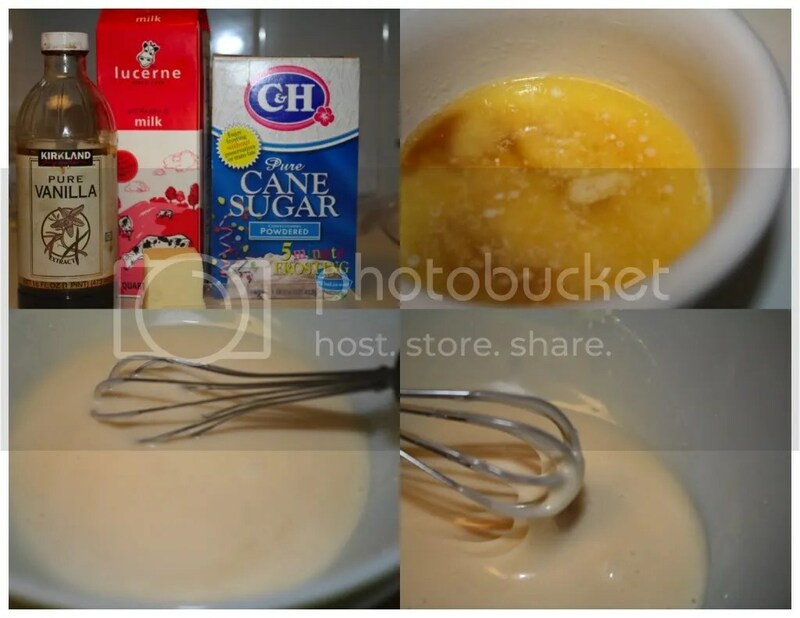 Put powered sugar in a separate medium sized bowl and slowly whisk in wet ingredients. If it is too thin, add more powdered sugar. If it is too thick add more milk.